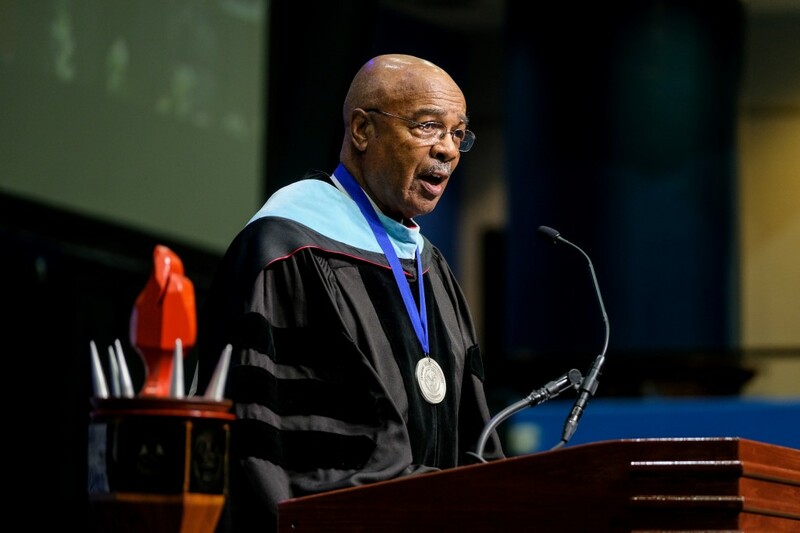 Jackson State University interim President Rod Paige, the first African-American to serve as U.S. secretary of education, will receive an honorary Doctor of Humane Letters degree at Indiana University Bloomington commencement ceremonies on May 6. “I am humbled and gratified to receive this distinguished honor. I remember my time at IU with great fondness and appreciation. The education and support I received as a graduate student was instrumental in shaping my future for the better and I owe my alma mater a debt of gratitude,” Paige said. Paige, who served as President George W. Bush’s secretary of education from 2001 to 2005, received his undergraduate degree from Jackson State University. The Monticello, Miss., native moved from classroom teacher to college dean and later to school superintendent to become the first African-American to serve as the nation’s education chief. The son of a school principal and a librarian, Paige grounded his professional career on the belief that education equalizes opportunity. His views and philosophies on education are captured in “The Black-White Achievement Gap: Why Closing it is the Greatest Civil Rights Issue of Our Time,” a book he co-authored. Paige spearheaded the historic No Child Left Behind Act, which set new accountability standards nationwide for K-12 schools. As dean of the College of Education at Texas Southern University, he created the Center for Excellence in Urban Education. He was also the first African-American superintendent of the Houston Independent School District, one of the nation’s largest. He earned the master’s and doctoral degrees in physical education from IU’s School of Health, Physical Education and Recreation, now named the School of Public Health Bloomington. In 2013, he was awarded IU’s Distinguished Alumni Service Award. Earlier this year, Paige was presented with the UNCF Excellence in Education Award and the Outstanding Educator Award from TSU. He was inducted into the JSU Sports Hall of Fame in 1988. Paige, along with wife Stephanie Nellons-Paige, served as honorary chairs of the Jackson State University National Alumni Association’s (JSUNAA) most recent Black Tie Scholarship and Recognition Gala.